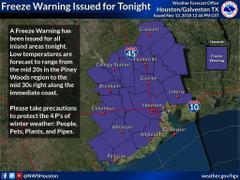 the inland zones are expected to fall below freezing late tonight. * EVENT...Temperatures falling to 27-31 degrees. * TIMING...Late tonight into early Wednesday morning. conditions may kill sensitive vegetation.